I was going to call this ‘I can’t believe it’s not Parmesan’ but of course you won’t mistake this topping for freshly grated parmesan. The good news is, even though it tastes different, it’s actually really delicious and even though I’m back to eating dairy, I often reach for this topping to give crunch and extra depth of flavour to salads and other dishes. 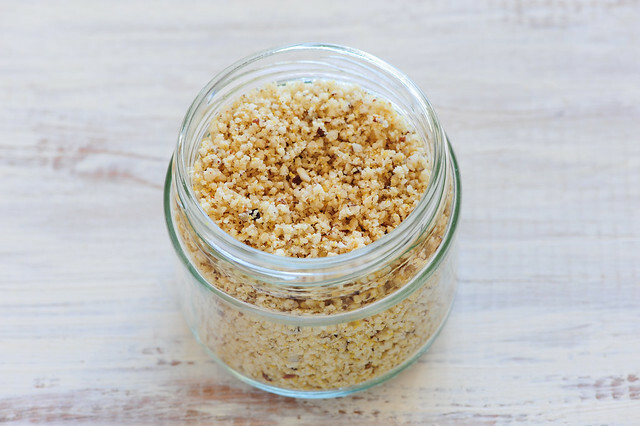 Nutritional yeast is also a great source of B group vitamins. Enough for about a cup. 1. Whizz everything together in the food processor. Store in an airtight jar in the fridge. short on time / yeast & onion-free – just grate whole brazil nuts with a microplane.